As one of the most widely used pieces of grip gear on set, a grip head - AKA a gobo head - is a production essential. It's usually found at the top of a grip stand (also known as a C-stand) and acts as a multi-functional mount that provides a secure grip on 5/8" and 3/8" diameter rods. It's excellent for providing exact positioning of nets, flags, lights and props. 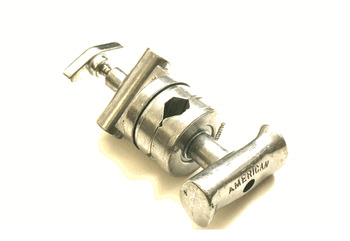 Each one features a 5/8" diameter receiver for baby pin mounting on light stands or rigging clamps. Matthews Grip Head Black 2.5"
With over 20 years in the film and video industry, BarnDoor Lighting only offers the best grip/gobo heads by American Grip, Avenger Grip, Matthews Studio Equipment, Modern Studio Equipment and Kupo. We offer popular options, such as the Matthews Gobo Head (4 1/2"), to help you find a style that suits your specific needs. BarnDoor Lighting is always on hand to answer your questions at 1-888-276-3667 or info@barndoorlighting.com.